Today is the first podcast episode of 2016! 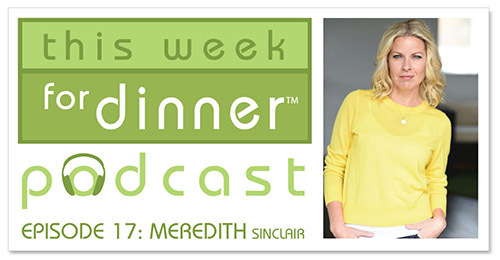 To kick things off right I am talking with Meredith Sinclair from the blog Meredith Plays. Meredith has a Masters in Education and has been parent blogging for many years. She focuses her work on the importance of incorporating play into your everyday life and makes regular appearances on The Today Show among other programs. Meredith is a smart woman and a delightful person to be around and I had a great time talking with her for the podcast. Meredith shares a great crockpot recipe that she cooks for her family regularly and, in case you have leftover champagne from New Year’s Eve, she has a tip for keeping it bubbly! Dump chicken, salsa, corn and black beans in a slow cooker. Stir. Cook on high for a few hours until chicken is cooked through and falling apart. Add jalapeno rings during the last hour or so of cooking. Serve with tortillas, cheese, lettuce, or whatever you like to make burritos or serve top on tortilla chips.